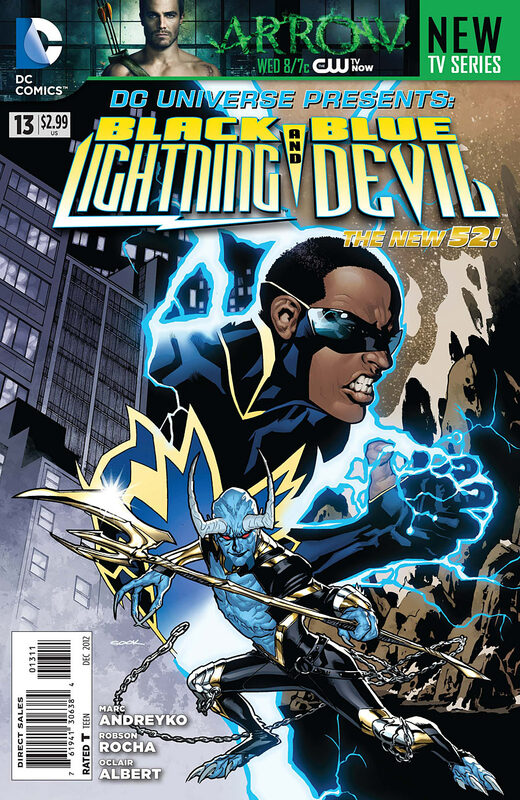 The New 52 debut of not one, but TWO heroes – Black Lightning and Blue Devil! Fan-favorite writer Marc Andreyko kicks off our strangest team up yet with a stunning mystery! Can these two VERY different heroes keep it together without killing each other long enough to unlock a new corner of the DC Universe? Art- The biggest and best selling point for picking this up is the art. Blue Devil has the stylized horror movie feel while Black Lightning has this slick redesign reminiscent of his original costume. Cover- This is a great looking cover, Black lightning (Clearly the bigger star) gets the lion’s share of the cover while Blue Devil gets a cool 90’s style power rangers pose at the bottom of the cover. Very visually pleasing! Action- One thing that you can’t say this issue did not have was loads of fisticuffs, sure to keep action junkies happy! Black Hero- So this marks the triumphant return of Black Lightning to the DC universe in the NEW 52. Not a stellar debut but at the very least he’s not in limbo going unused like so many other Black Superheroes. This was not the best crafted story of the new 52 so far. It may be comparable to Mister Terrific in just how much fun I was not having. I’m still pretty pissed that Black Lighting has been returned to youth (we lost both Thunder and Lightning his daughters as a result). He’s still a teacher sure but his costume….a pair of glasses and a bodysuit could not possibly protect his identity in a world where the picture of a nose can lead to someone’s identity. But then again Superman just changes his hair stye so this is par for the course I guess.